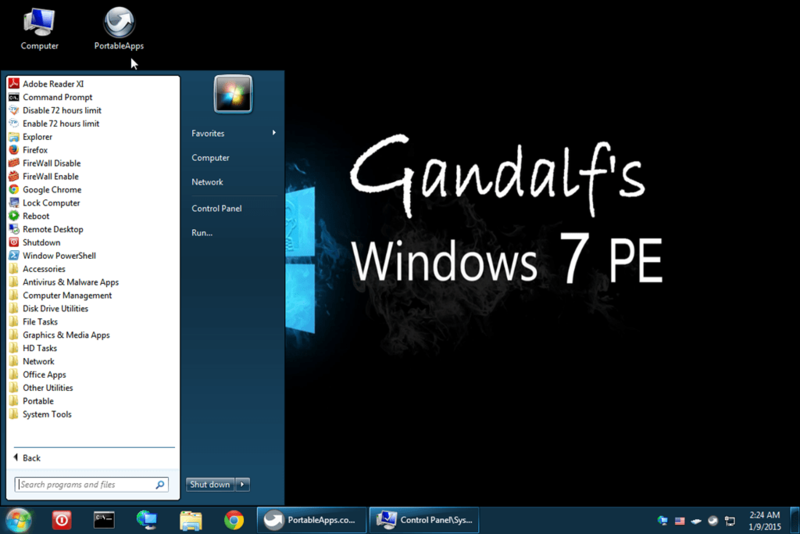 This is my NEW Windows 7 PE for those who prefer to use Windows 7. This version includes many new requested apps and the USB portable apps can be updated when needed or you can also add any new apps you need to the USB. 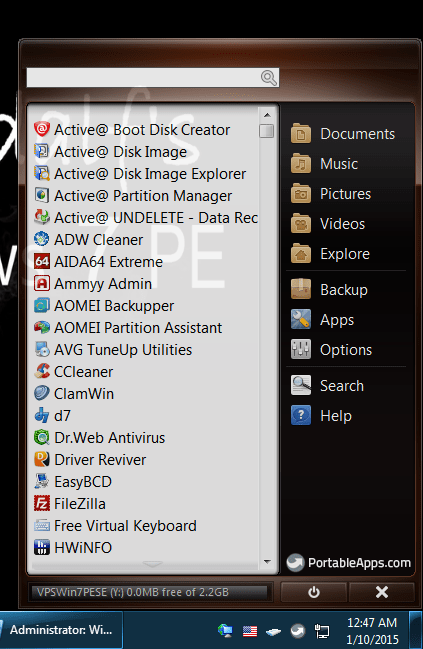 ADW Cleaner Malware remover AVZ Antiviral Toolkit Advanced tools capable of removing SpyWare and AdWare modules. If you prefer to use the Portable Apps menu instead the in run the Portable Apps Menu shortcut on the taskbar. The portable apps menu also allows you to download more apps by selecting the Apps>Get more apps. These freshly downloaded apps will be saved to the USB drive. ***For all those having issues with the 2gb iso file download I have heard there are timeout issues downloading 2gb or larger files. I have rared the iso and put in a folder inside the same folder. 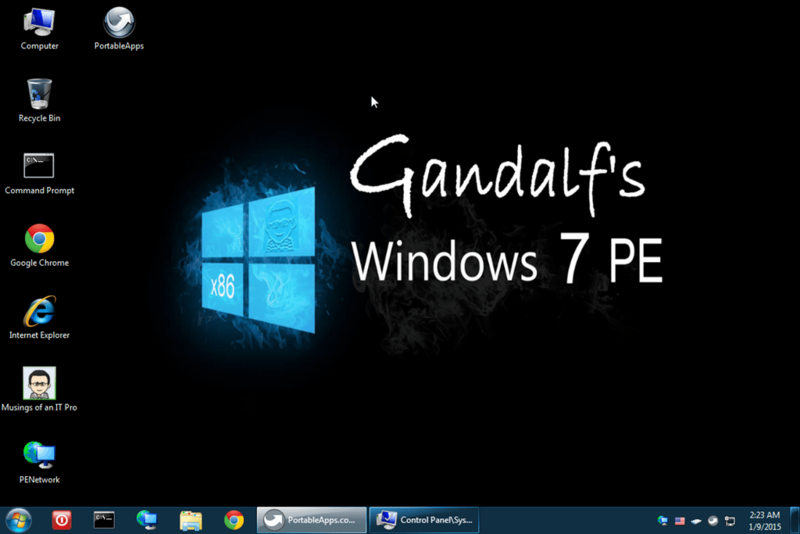 It’s called Gandalf’sWin7x86PE.rar and is inside the folder called “download from here if having problems with iso file” Try downloading that one. Be patient it sometimes takes 2-4 minutes for the download to start. can’t download your windows 7 pe.iso because login to onedrive is required. I will check, but you can always sign up for a Onedrive account. They’re Free. For all those having issues with the 2gb iso file download I have heard there are timeout issues downloading 2gb or larger files. I have rared the iso and split it into two parts. It’s in the folder inside the same folder. The two files are called Gandalf’sWin7x86PE.part1 and Gandalf’sWin7x86PE.part2 and are inside the folder called “download from here if having problems with iso file” Try downloading those. Hi there, just wanted to send an update that I’ve been having difficulty downloading the ISO and RAR files. I’ve tried it via different browsers, computers and locations. The same holds true for the older WinPE iso files released last year. Happy to report that the new split of the files worked. It downloaded the file as one big zip file, labeled: One-drive.zip, which in turned, contained the two rar files (exe + rar), which extracted, had the ISO file. On a slightly related item, prior to seeing your update with the new files, I was able to download the original 2.1GB ISO file from the root folder. Not sure if it was the time of day, something to do with One Drive or with you splitting it up. In either case, thanks much for your hard work in making these available. The two-part file seems to be corrupted. WinRAR says it’s fine, but the ISO image that I extract won’t burn to DVD (I get a “bad blocks” error), and although it will install to a USB stick, it won’t boot (says sacdrv.sys is missing or corrupt). Is there any way I could get you or someone to upload the full iso image to something other thane Microsoft’s drive thing? Because they want me to sign up but in order to do so they want me to divulge waaaay more info than I’m comfortable with. What’s wrong with mega or something? I had the same issue as D-tox (Only I use Xboot). I read the error message that comes up on the desktop after this partially failed boot, tried all the suggestions, and none of them worked entirely. The way you created this PE, by having the system load the media as a virtual disk(Y) makes it very hard to use loading as an ISO from a USB stick. My solution was to place an ISO I created in the root of the USB stick named Win7PESE_x86.ISO along with the marker file CdUsb.Y I essentially just pulled the “program files” folder out of the original ISO and Isocreater to turn them back into a non-bootable ISO that the bootable ISO could find and mount. Whats funny is that the dual boot 8.1 PE ISO doesn’t have this issue. Are you sure there is not audio detected? There are no system sounds loaded so if you are just clicking the speaker icon, you’re not going to hear a ding. Is there an X on the speaker icon in the tray. Who makes you audio driver? I will try again on another system. I loaded the drivers for my system, as well as a massive audio driver pack. I noticed that the sound mixer app is missing, so maybe its just muted? I’ll get back after testing. Tried on another system and while the audio driver is present, the following error occurs when trying to install it: “The install class is not present or invalid”. Also all of the sound device software is missing. Looks like mmci.dll is also missing, which controls audio. I don’t know a lot about building PE yet, but in trying to figure this out, I read that dx11 needs to be included as well as some audio.script. If you get around to rebuilding this I will happy to test it, especially if you can pull off an x86/x64 version!Thanks for all the work you have done, that Windows 8.1 build is AWESOME! Do you have some instructions on how you injected the network drivers into the wim file? I can’t seem to find info on how to do this anywhere. You could inject your drivers into the offline wim file and then save the changes. Or a simpler method is to just open device manager and for each problem device update the driver by pointing to your C:\Windows\System32\DriverStore\FileRepository directory. It will pick up the drivers of the system you are booted into. The two .rar files are ok. The created bootable usb drive it’s ok.
How to add the ghost32 or ghost64 v12, in usb? Aquí en Panamá las PC que compramos no vienen con Windows 7, 8 o 8.1 ya vienen pre-instalados por eso nosotros no tenemos el CD de Windows que necesitaríamos para hacer el WinBuilder así que solo podemos hacerlo si bajamos imágenes ISO de prueba de la Internet. Con el windows 8.1 ya hemos construido un windows PE básico sin agregarle nada a lo que viene por defecto pero el 8 si nos da problema porque siempre envía este mensaje aun que estemos conectados a internet. WIMGAPI.DLL was not found y no podemos continuar que me recomienda – si pudiéramos hacerlo sin estar conectado a Internet todavía mejor. Aquí en Panamá el Internet en la Universidad es muy lento y no da para que trabajen mas de 40 estudiantes. Entonces usted puede utilizar WinBuilder con estas imágenes iso . Como posso adicionar o ImageX para capturar e aplicar imagens e diskpart. How can I add the ImageX for capturing and applying images and diskpart. I have a question since may could use thin to play some games that incompactible with win 10. Could I update the directX if I burn the iso into usb? How can I get an application to launch at startup as I have tried with no success. To disable the “press any key” remove the bootfix.bin from the boot folder in the iso. For those who are wondering how to inject your own drivers I can report that after much research I worked out how to do it. 2. Download all the drivers you wish to add into the image, put them in a folder (in my example I put them at C:\Mount\Drivers). Also, don’t make the mistake I did make sure the drivers are all 32 bit drivers. Or just watch my video HERE It makes the process much easier. So if you have a hard drive from a recent laptop that may have gone bad and want to copy off files, do data recovery, etc. then this is what you need (a dual x86/64-boot would be even better). Typically, the Win8+ PEs will bog down and not complete booting, in this context. is the utilities in this updated with newest version? or i should download the Win10PE version for the newest utilities? Thanks allot my friend from your share it’s so much useful. It looks like the apps does not work.. Anybody know why i have some problems with this? Tried both usb 3.0 and 2.0 and no difference. Im combining this iso with easyboot system.. And i have a win8.1 PE 64bit from gandalf where the apps work fine on the same usb..
Downloaded the Win7PE disk. According to your site it also contains TeamViewer. Maybe I’m overlooking it, but so far I could not find it. Cant remember if it had teamviewer will have to check. New builds dont have games. Buenas tardes. Anteriormente le mande un mensaje para que me ayudara y lo hizo. Ya tengo el conocimiento para crear sistemas operativos portables en pendrive. Aun dictamos lenguaje C basico con BorlandC o TurboC de la version 2.0 para programar en bajo nivel. Las imagenes que genero aqui no permiten que corran programas de 16 bits aunque tengan arquitectura de 32 bits los sistemas operativos. El concepto de compatibilidad que se permite en los sistemas completos no lo he podido implementar aqui. Me podrias dar unas ideas de como poder hacerlo. Los estudiantes de la Universidad tecnologica de Panama y YO te estaremos agradecidos. Just downloaded Gandalfs 8.1 x86 iso and i am trying to add it to a multiboot USB using YUMI…. No success…. hello dear gandalf – well i wonder if i can create a LIVE CD (or dvd) instead of a USB. Is this possible. I run linux and i can create a ISO DVD – with ease. I use k3b to do this. Many of the apps on this version will will not work correctly if written on a Read only DVD since they write certain files when run. Just get a USB large enough to accommodate this build 4gb stick would be good and use Rufus to burn. Just browse for the location where you save the iso and leave the rest of the defaults as is. Wonderful x86 version. Now i have the two best WinPEs in the world ! Thank you again for your work. I just wanted to point out that this version is perfect for older machines. It loads successfully on a machine that has only 1GB of RAM compared to the x64 version which doesn’t. That being said, do you know what would be the strict minimum for this x86 version? I was a bit surprised to see it run on 1gb :) works decent too! I just want to express my appreciation for your work and to add some comments. I had a terrible time with the download, even with a download manager and the 2-piece .rar download. It took over 24 hours of trying and retrying before success. I am using this in a hybrid multiboot of the Hirens BCD Rebuild along with XP and Win 10 (not sure why, I just like it.) I am booting from the ISO, so I have moved the PortableApps out of the ISO to allow access from all three OS. This also allows the use of the PortableApps from the host system without booting one of the PEs. This is very valuable for malware/anti-virus scans because it seems they cannot scan an offline registry. I am also using a merged version of the HBCDmenu, which is also removed from the ISO for the same reasons. It is also much easier to edit and update the portable programs. I am running the W7 one from USB, and have allowed ‘Portable Apps’ to update. That way the DVD could be up to date, if I needed to use that DVD (instead of USB) on another PC. Say on a PC that is difficult to boot from USB. Seems like alot of work for a few updates and a fussy system but you could take the original iso and use ultraiso or similar app to overwrite any updated apps and then save the iso with a new name and burn it to dvd instead. Buena noche. Anteriormente le mande un mensaje para que me ayudara y lo hizo. I can’t believe I can’t figure this out, but no matter what I do, I get the WinPESE error and, of course, there is no Drive Y and nothing works. I’ve tried Rufus, and the MS tool. The log shows a series of timeouts which exceed 30 seconds. All of the other disks (8.1, 10) work fine, but 7 is resisting mightily. Thanks for all of your amazing work. All of the downloads stored on OneDrive are not functioning today, and come up with message that you’ve exceeded your usage quota. The MEGA download of this item IS working. So signed up for the free MEGA account, and tried that download via FF extension. It was soooo slow, and would have taken well more than 8 hours. Took about 1 hour, so no complaints there. PS Is there a setting in MEGA to turn off encryption ? Is any chance do make PE with choice OPTION ON BOOT of page file size and destination like 1Gb 2 GB ect. where you have a HDD free space fo it. The reason why I do ask is when I add drivers pack and I have only 2GB RAM Memory is not enough RAM Memory for unpack wim file is to big in modify version by me. I just wanted to add my $0.02 – the md5sum of file downloaded via Mega is different from the one on OneDrive. The OneDrive ISO has the md5sum stated in the CheckSum.md5! Don’t use Mega as there’s probability it has been tampered with. Thank you for sharing the ISO. Do you have the updated checksums, md5sum, sha256sum ? I have re-downloaded the iso from MEGA, the md5 checksum is the same wrong checksum cbd9e3c039f0a91f3c58faa80d83820a. The file cannot be found in OneDrive. Please can you send me a direct download link, thanks. Same checksum here, i’ve downloaded from Mega. What’s wrong Gandalf50, the uploaded ISO file or the checksum ? Hi, i went to download this and it does not seem to be in either the one drive or the mega anymore? I have looked all over and cant find it on any other sites. Is it gone or is there still a chance of getting it? Tried Mega but it wanted to download a Firefox extension and I dont really trust those. Atempted to boot a Toshiba Tecra M10. The boot process was fine but . . . .
“After a while” means if you touch nothing but just let the boot process complete then the screen dies about 2 minutes after the Network screen has appeared. Seems to be about the same length of time if you do stuff on the system. So, around 2 minutes after the boot completes the screen goes black. How do I troubleshoot/fix the Toshiba problem? It may need a video driver injected into the wim for that system. Thanks – I’ll have a go. IIRC there are some notes on injecting drivers somewhere on this site. On a different front, how do I add portable apps that are not on portable apps.com (e.g xplorer2)? Just install USB? Dear Gandalf, it’s a very great stuff you worked out. Sorry, my english is not the best. Could you give me please a direct link for your Win 7 PE? hey Gandalf. you certainly are a smart guy. and obviously a hard worker. could you send me a link, as well, to download the windows 7 pe x86 version? thanks! I bit the bullet and created a Mega account, and allowed their extension. The free account at Mega keeps floundering. I was even tempted to purchase the Lite (5 Euro) Plan, to see if that helps the atrocious Mega download speed, but they don’t take PayPal. Is it possible to get a direct download link ? Please send me a download link Gandalf? OOPS! I just sent this with an incorrect address for myself…! I’m a volunteer with a small NGO in E Europe. Three of four computers have issues, only made much worse by the guy who was supposed to be helping us sort them out. I have far less experience but at least have so far made a little FORWARD progress during my “spare” time in the past month! Your 32-bit Win7 PE iso seems to be exactly what I have been searching for, but One Drive tells me it’s been removed or I am unauthorized to access it. Would you be kind enough to send a link where I can download this very promising set of tools? Thanks so much! I’m building my multi-boot drive now. One more thing: I intended to recommend this great little program, but forgot to include it with my inquiry. It would make a fabulous addition to your collection. Available in paid editions or free Lite, including portable options. Sadly, not for Linux…. Firstly, thank you very much Gandalf50 for making this wonderful handy ISO available to download. I think I may be having trouble with the ISO download from Mega, which on my first attempt did not match your given checksum posted there. Suspecting a bad download, my subsequent repeated attempts to download resulted in identical files (and checksums) to the first one, all of which did not match your given checksum at Mega. As I have now noticed the checksum was posted at Mega the day prior to the ISO, could you confirm that the checksum is in fact still correct for the ISO currently available to download? Also, I was wondering if you were involved with an older similar PE ISO I am looking for called HawkPE-43? i will ad you to onedrive share. but will need a proper email. First, I probably should have mentioned in the initial post that I was creating my multi-boot USB via YUMI. Already loaded on that drive were Linux mint Cinnamon Sarah, both 32 and 64 bit versions. YUMI couldn’t find a configuration file. 1) Extracted the gandalf zip file onto my HDD, which created an iso. 2) Ran YUMI again to carefully add gandalfs via the GUI to the Linux mint distros already on the USB. FWIW, I had no trouble with the drive while installing the Linux versions, but had not yet tested it. That was my plan for immediately after the gandalf PE…. Just use the portable apps downloader and install it on the usb. I apologize to chasing you again on this topic but it looks like the MD5 checksum is different from the one you provided. I downloaded the file from MEGA; I found another copy on BR2SHARE and still the MD5 on both files is cbd9e3c039f0a91f3c58faa80d83820a as reported from other users. Could you please verify again and/or share with me the file with the correct MD5 Checksum? Is there another place where I can download the file other then MEGA? Thanks… Everything is working perfectly but need a little help from u… Is there any way that i can add the apps which can be seen from windows default start menu… Thanks on adv. I downloaded your great Win7PE iso from Mega. Any idea where I could download the correct one? Do you have an alternative download link with the correct file? And the ISO file at Mega is from 2015. So it was not changed the last 2 years. Is there anyway to integrate .net 2/3/3.5/4 into this image ? The .net 3.5 applications I tried does not see the framework in your Winpe7. I tried to build winpe7 using winbuilder , it is the same. For some reason, .net framework is not being detected or working correctly.